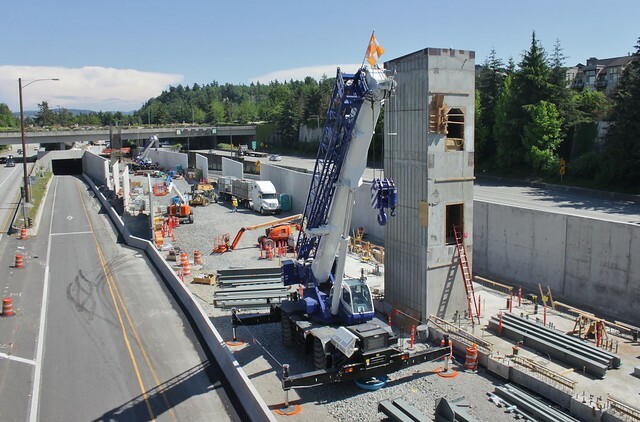 It’s been just over two years since Sound Transit broke ground on East Link, the 14-mile light rail line that will funnel Eastside traffic into Downtown Seattle and points beyond. As promised last week, I’ve got more photographs and recommendations across the entire first phase (as the Downtown Redmond segment hasn’t quite started), but will have to split this into two halves because of length. For this tour, I’ll be showing stations from west to east, which is in reverse order from my personal preference. Visiting all the East Link stations in one or two days is not quite as easy as Northgate (where the stations are all linked via a single bus route). I take my photos in batches divided by general region, usually starting east from Overlake and working my way back via bicycle or one of the local buses (the B Line or 226 in particular), but it can be just as easy to work your way west from Downtown Seattle along I-90. To begin, we’re starting at a station that will never see a Blue Line train: the humble Stadium station on the SODO Busway. 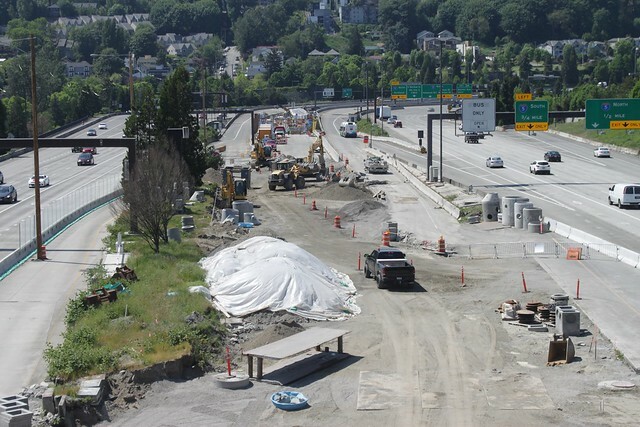 Here, there are nice views of the sweeping highway ramps of I-90, including the former express lane offramp that will be retrofitted for use by East Link trains. The underside of the ramp now sports some scaffolding and stairs, in preparation for seismic retrofit work that will last until late 2020. East Link’s first outbound station, Judkins Park, is somewhat hard to photograph from close up but has some convenient hills and bridges that can be of use to photographers with a good zoom lens. 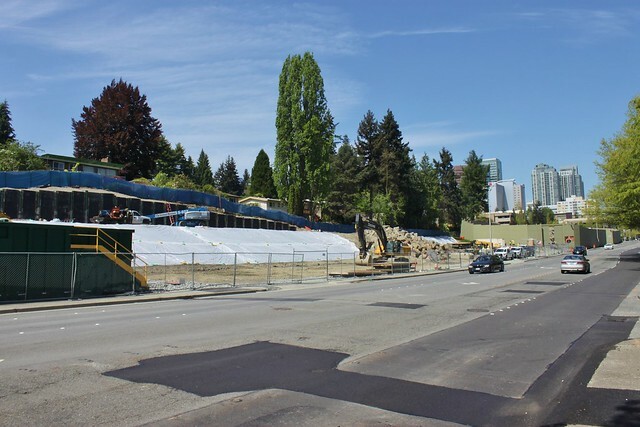 A set of stairs at South Atlantic Street and 15th Avenue South has the best east-facing view of the future station, aligning with the lanes of I-90 and allowing a peek into the Mount Baker Tunnel. 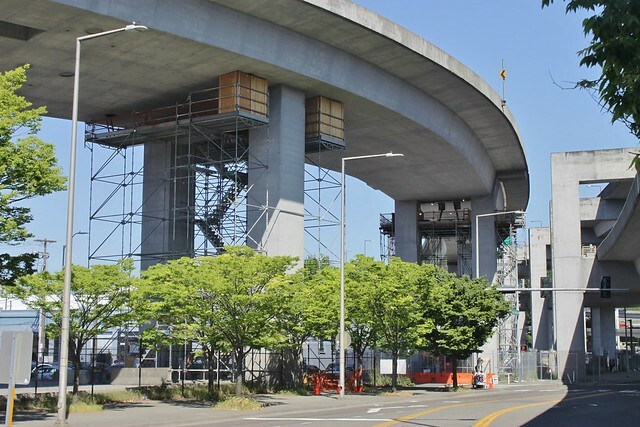 I recommend sticking around until a bus pulls up to the Rainier Freeway Station, as these shots will become impossible once the flyer stops close for demolition in September. For an up-close shot, you can try your luck from the Mountains to Sound Greenway (aka the I-90 Trail), but the conditions are all around unpleasant: a fence blocks the view, the angle is awkward, and the noise and smell from cars whizzing by and below can be hard to stand for more than a minute. Luckily, there’s a good west-facing view just ahead on the trail: the top of the 23rd Avenue South lid, where the station’s future east entrance will be (including murals of Jimi Hendrix and an excellent bus-to-rail transfer). To get a clear shot, one has to push away some small shrubs and walk in the dirt, as the sidewalk has an obstructed view. There’s also a small paved viewpoint at the southwest corner, but it is hard to see from street level and is often occupied, so exercise caution. There’s one last view from the city to photograph before we can head over Lake Washington to the great beyond: the all-important floating bridge. 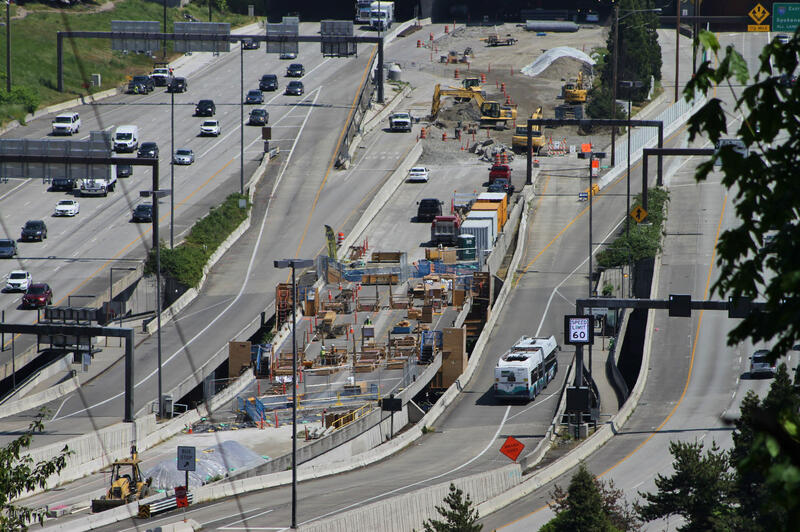 Continuing east on the I-90 Trail and through its dedicated pedestrian/bicycle tunnel, you’ll emerge just under the East Portal Viewpoint, a handsome park with a stellar view of the bridges and the Bellevue skyline in the distance. 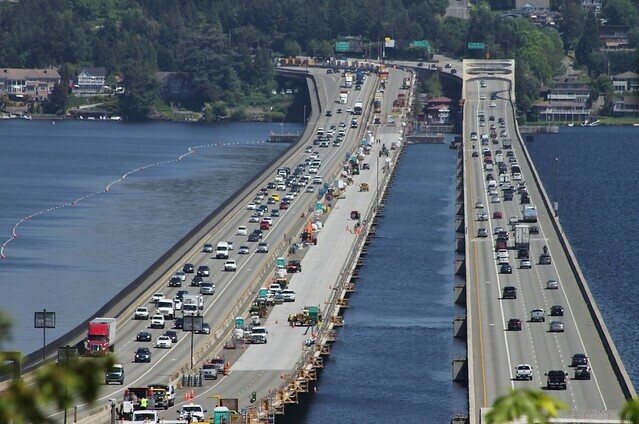 For the next few years, work on the bridge will be mostly out of sight, with seismic retrofits and pontoon post-tensioning taking place while the deck is left mostly undisturbed. The Portal Viewpoint will be the place to be when trains make their first test runs across the bridge, which is just over three to four years away. Further uphill, you can get an even better view from one of the many side streets on Mount Baker Ridge, though they may be obstructed by trees and utility poles. If you turn around at 31st Avenue South, you can also get a nice view of Downtown Seattle’s skyline from a small viewpoint park that also overlooks a vent for the Mount Baker Tunnel. 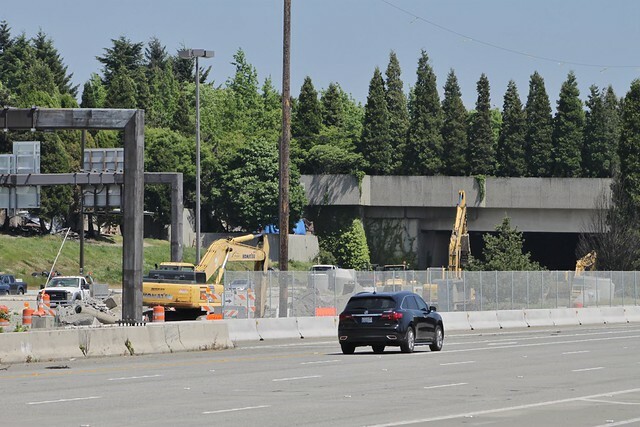 Our first proper stop on the Eastside is also the furthest along in visible construction: Mercer Island Station, in the median of I-90. 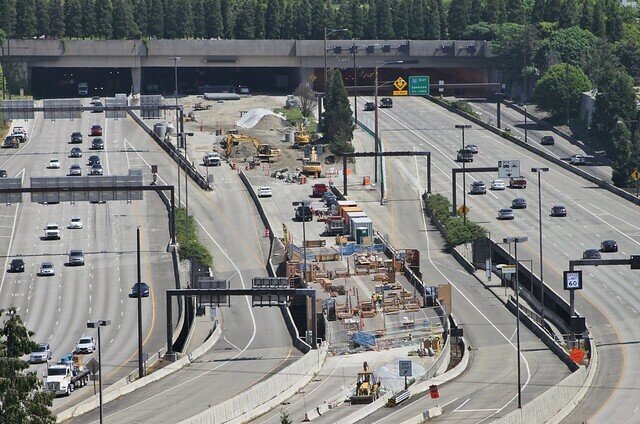 Both entrances are on overpasses that have been conveniently stripped of their vegetation, leaving behind a clear, unobstructed view of the work below. The west entrance on 77th Avenue has already sprouted an elevator shaft, the very first on East Link so far, and stands out a bit like the monolith in Arthur C. Clarke’s Space Odyssey series, beckoning Mercer Islanders to shed their cars and evolve into regular transit riders. To the west of the station, the first rails for East Link will be delivered and installed within the next few months, well before any test trains will be able to run over them. The east entrance is a bit further behind, but work on its elevator shaft and the maintenance rooms in the bowels of the station are well underway. From here, you can also get a better view of the station’s sound walls, which will eventually be covered in ivy and other plants, to avoid sullying the eyes of the station’s future patrons with its bare form. Continuing onto the mainland Eastside, where property values are slightly lower and the transit service is much better (but still not great), the next East Link stop is its most isolated. The South Bellevue Station is really only accessible via Route 550 and Route 249, thankfully with good frequency on the former, and doesn’t have an open sidewalk that connects it back to the rest of Bellevue. 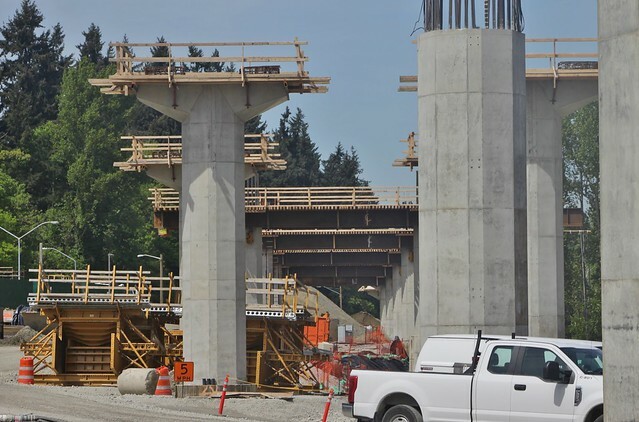 The station has been close behind Mercer Island in terms of progress, with plenty of columns arranged in neat rows, widening outward as they approach the future platform. A small parking lot meant for access to the Mercer Slough Trail allows pedestrians to walk under the future guideway and get a peek at the elevated columns. 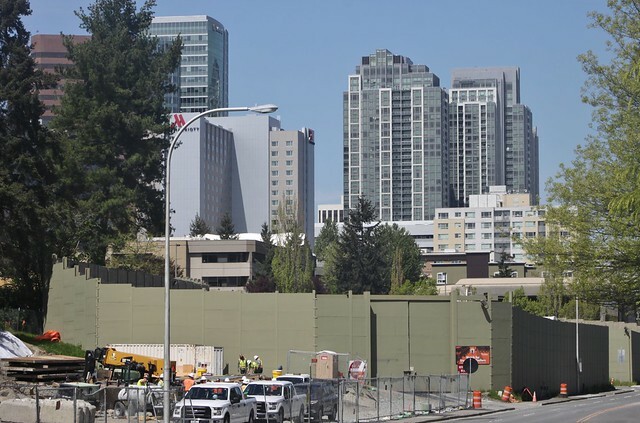 Beyond South Bellevue, trains will dip into a trench running along the western edge of the Mercer Slough and under the now-closed Surrey Downs Park to East Main Station, right at the south end of Bellevue’s short tunnel. 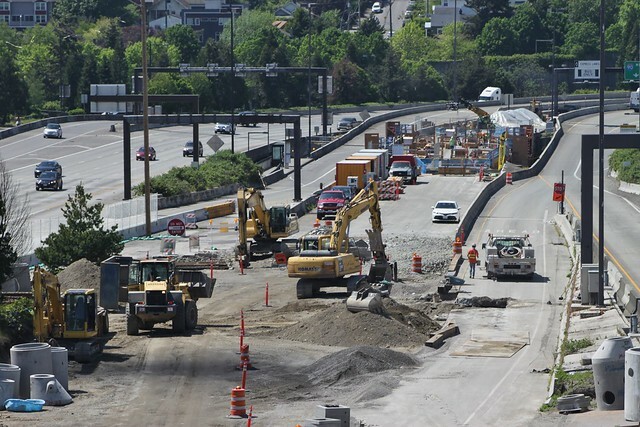 There’s some trenching work being done on 112th Avenue, but the lack of sidewalks and transit service makes it difficult to visit, and isn’t of much interest until construction of the undercrossing at 15th Street begins later this year. Work at East Main Station is also in its early days, and the gates at the portal’s sound/dust wall are often closed, so there isn’t much to see here, unless you are willing to camp out and wait for the next dump truck to leave the tunnel. The tunnel is, of course, inaccessible to the public (for now) and is a good place to stop this photo tour. 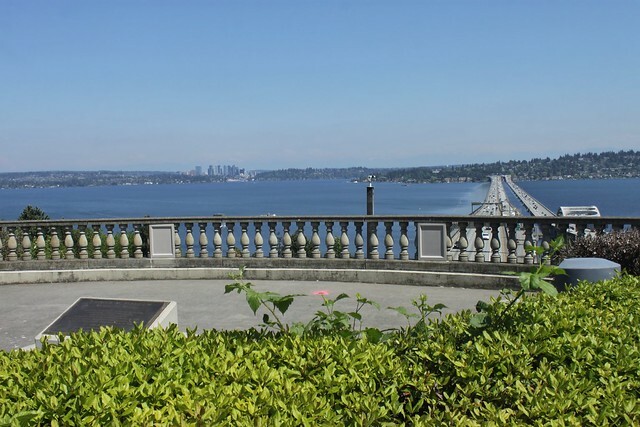 In part two, we’ll press onwards through Bellevue, Bel-Red, and Overlake, a trio of areas with plenty to see and all within a short, bike-able distance. Stay tuned. In the past ~5 days (basically right after you took your photo), some steelwork has been erected at the west (77th Ave SE) entrance to Mercer Island station, so that headhouse is rapidly taking shape. IIRC, this station will be completed in mid 2019, and should be the first East Link station finished. 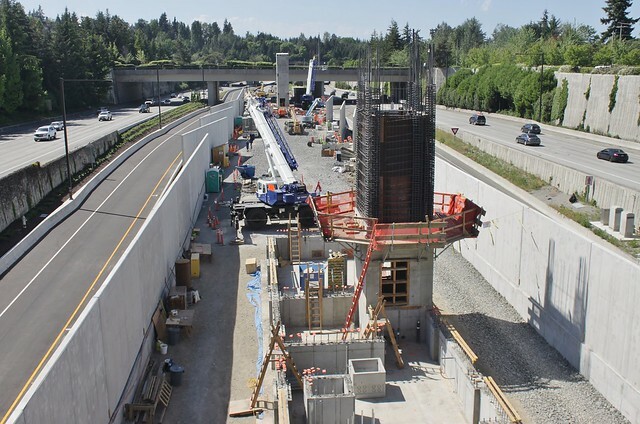 Rail delivery is occurring just west of the Mercer Island station, not just east. They close the eastbound HOV lane through the Mercer Island Lid and the HOV exit to Island Crest Way to facilitate this. Instead of having the railway cross over 112th Ave SE at SE 15th St, the road will instead go over the railway. Cars can handle sharper turns and steeper grades than trains, so it ended up making more sense to put the road over and keep the railway at grade. Thanks for the correction about the rail delivery and heads-up on further progress on the island (I joke that my pictures become outdated within a few hours of shooting). 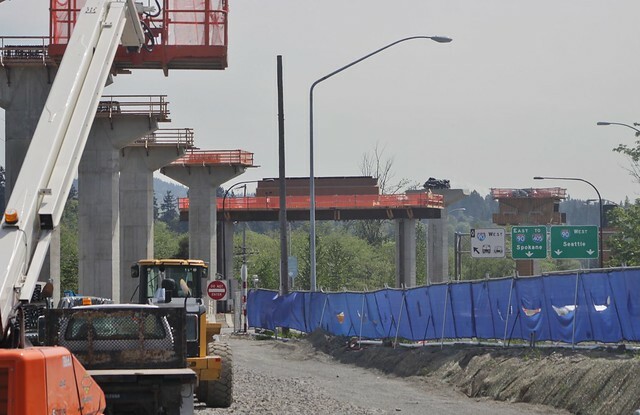 I’m still a bit confused as to why Sound Transit is putting in rails this early in the process, though, but I’ll be glad to see them laid down sooner rather than later. Thank you for these photo tours. It’s great to be able to see the progress. Cameras are really limited for this project and those of us who don’t travel much dont see much. Seeing the whole alignment is pretty easy in a 2-hour bike ride. 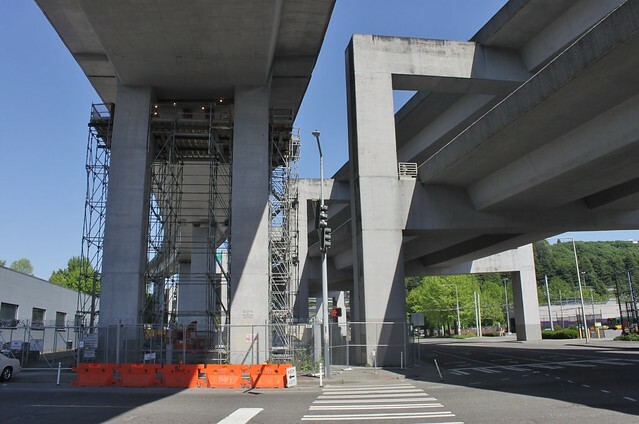 I like seeing the girders laid over 112th Ave NE and the early work over I-405, how the alignment crosses NE 8th and cuts behind Whole Foods, and how the OMFE work integrates with Bellevue’s Spring Blvd. Also ST and Bellevue and whoever else did a nice job connecting a new section of the Eastside Rail Corridor bike path. It’s paved for a bit from 120th/Bel-Red, and then very nicely graded gravel connecting seamlessly into the Cross Kirkland Corridor. I’ve only seen the parts visible from the B and 550, but the arc of stanchions between NE 8th Street and Bellevue TC is an interesting art piece in itself. Routes 241, 555, and 556 also pass the South Bellevue site.